The funniest tweets from people thrilled that Steve Bannon got fired. 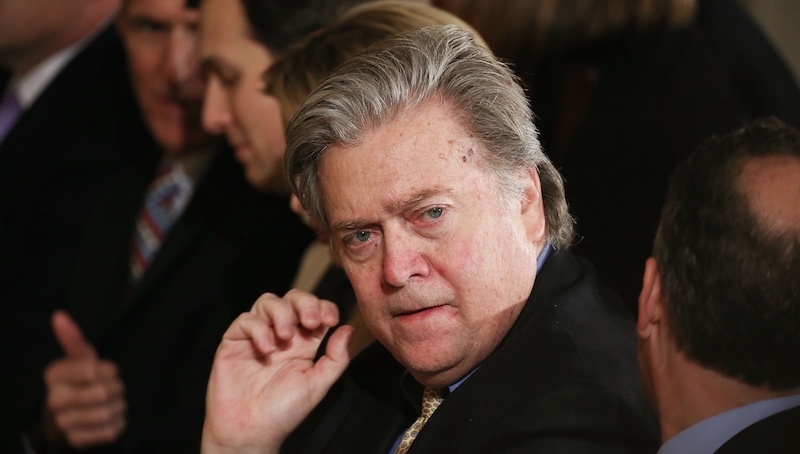 On Wednesday morning, White House officials confirmed that controversial strategist Steve Bannon had been removed from President Donald Trump's National Security Council. In his place, National Security Adviser H. R. McMaster will be running the NSC. This bombshell has sent shockwaves through the media—Bannon's policies have been dominant throughout the short, troubled history of Trump's administration. But many left-leaning social media jokers are thrilled to see Bannon, the founder of far-right conspiracy blog Breitbart News, lose his position on the Council. Here are the funniest tweets ripping into this millionaire we could find. Bannon's good looks could only get him so far. Congratulations to Steve Bannon on graduating from NSC in record time. Take a gap year, buddy. Take four. Steve Bannon may have been removed from the National Security Council, but he laid enough eggs there to make sure he'll always have a voice. I have removed Steve Bannon from Russia's US national security council. I hope someone wakes Steve Bannon up from his morning whiskey nap to tell him he's been removed from the National Security Council. Steve Bannon to return to creek from whence he was dredged. Bannon may be off the NSC, but you haven't heard the last of him. He's probably hiding in your crawlspace as we speak.